A replica of the world's largest coin is among the treasures to be offered at Dix Noonan Webb's coins, tokens and historical medals auction on 20 and 21 February 2019. The coins, tokens and historical medals sale will feature a 19th-century of the world's largest coin (pictured), which weighs 900g and measures 13.5cm. original, a coin which was discovered in Patna in the 18th century and which was last seen in the 1840s. The specimen, worth 200 mohurs, in the British Museum was formerly in the collection of the India Museum in London, which closed in 1879. 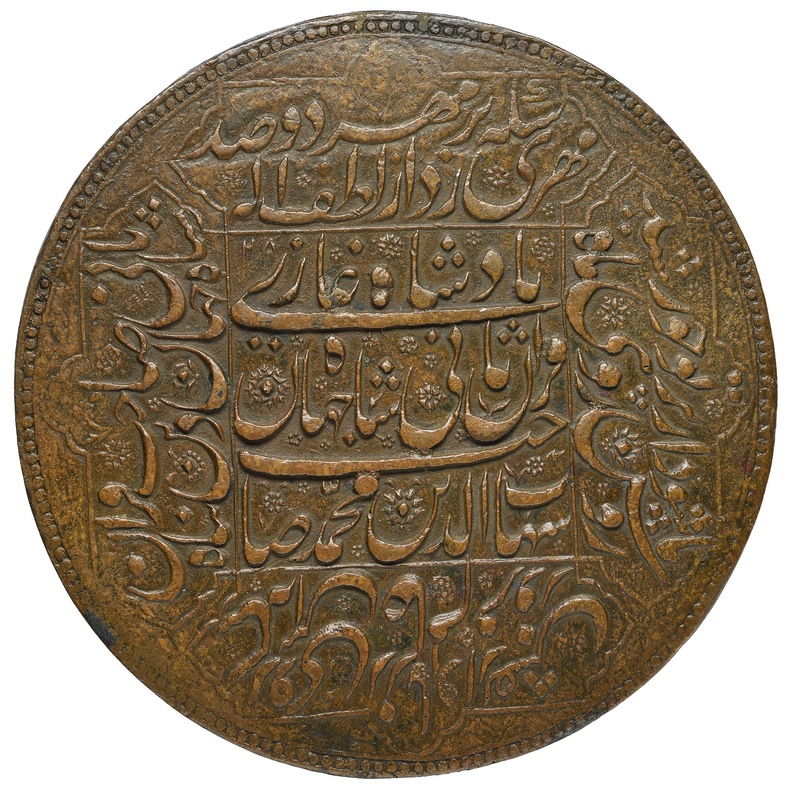 Mughal multiple-mohur coins are known to have been struck in denominations up to 1,000 mohurs, probably for presentation purposes; very few are known to exist today, as most were probably melted down at some point. Also included will be a very fine and very rare testoon (pictured) dating from the reign of Henry VII (1485-1509), which is estimated at £12,000-£15,000. This coin sold for £70 at the Wheeler sale in 1930, at the time one of the highest prices ever paid for an English hammered silver coin of less than crown-size. Also on offer is a copper-alloy Roman medallion of Severus Alexander (AD 222-235), dating to the period c.AD 231 (Reece Period 11) is also among the highlights of this sale. The coin depicts Jupiter naked holding a thunderbolt in right hand and long sceptre in left. Severus Alexander is helmeted, in military dress, stands facing him, holding a spear in left hand. Two medallions of this type are held in the British Museum and just seven Roman medallions are currently recorded, this example is the first of Severus Alexander and of the first half of the 3rd century all together. It is estimated to fetch £1,000-1,500. The auction will be held on 20 and 21 February 2019 at 11am at the Dix Noonan Webb auction rooms in central Mayfair - 16 Bolton St, London, W1J 8BQ, website.